Easter egg projects they’ll love! Few things are as much fun as dying Easter eggs with kids. 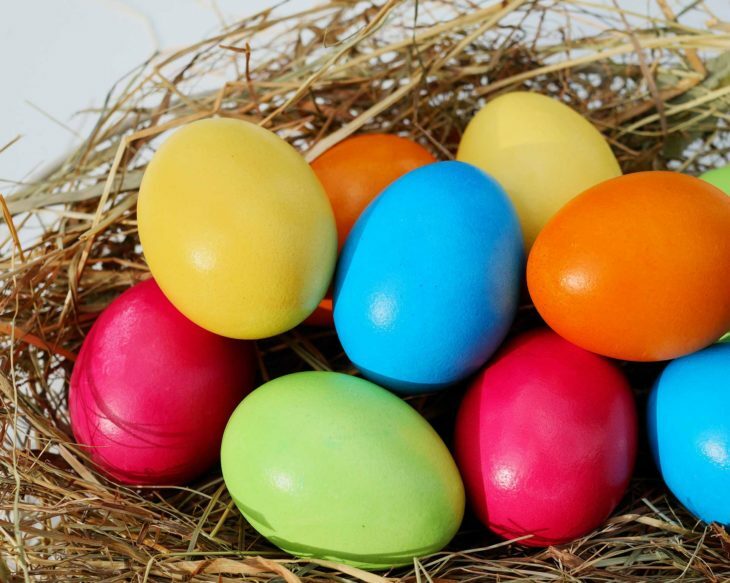 Try these Easter egg projects that your kids are sure to love! Create baking soda paint using a tablespoon or so of baking soda, a couple of teaspoons of water and some food coloring. Mix it up and experiment until you have the consistency you want. Grab a paint brush or stencil brush and start painting the eggs. 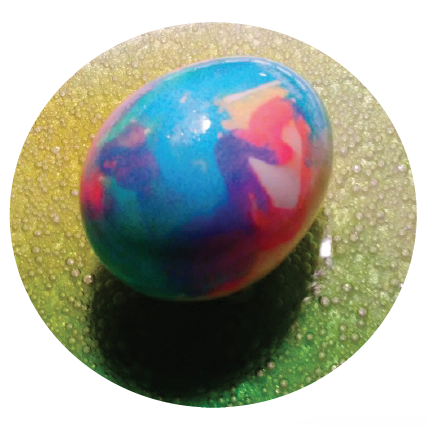 Drop some food coloring splashes onto your eggs using a dropped. Pour vinegar on top of the egg and watch the “volcanic eruption” all around your egg. Every time is different based on the colorful combinations. Repeat steps 2, 3 and 4 again and again until the kids get bored and are ready to move on to another egg. Pat off the excess vinegar lightly or just let them air dry. Add dyeing agent and 1-quart water and 2 tablespoons white vinegar to pot. Bring to a boil, then lower heat. Allow the ingredients to simmer for 30 minutes. Strain dye into a pot. Set raw eggs in a pot of strained dye; bring to a boil for about 30 minutes. Remove and dry eggs. These eggs are edible. *With beet and coffee dying, boil eggs first in a separate pot. Boil beets and coffee separately. Cool. 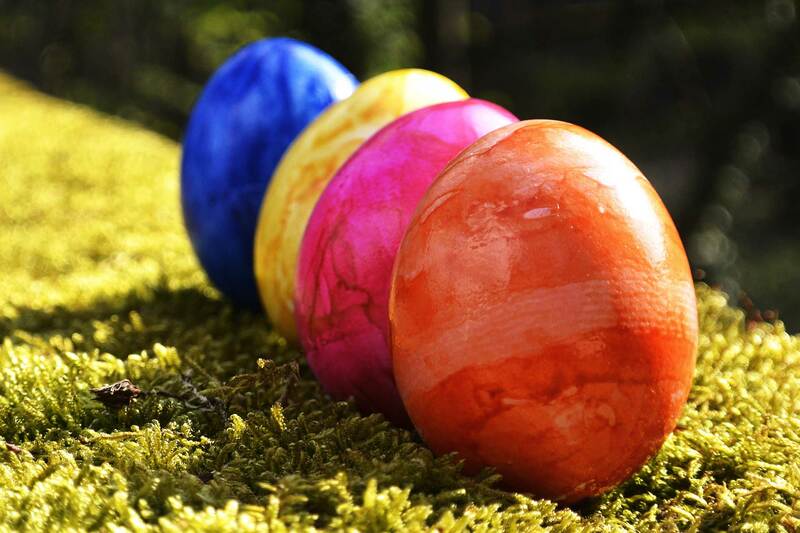 Drop hard-boiled egg in dye for 30 minutes. Cut the ties down the seam and remove the wool on the inside. Cut the extra fabric from the bottom of the ties to ensure a squarish shape. Next cut the white fabric into squares large enough to wrap around an egg and set aside. Holding a cut silk tie, color side up, place an egg, pointy side down onto the silk. Wrap the silk tightly around the egg, twist the top, and secure it with a rubber band. Next, take a white cotton piece and wrap the egg the same way you did with the silk. Twist the top tightly again, and secure with another rubber band. When the eggs are all wrapped, fill the pot with enough water to cover the eggs and add the distilled white vinegar. Cover and bring to a low boil for 15 to 20 minutes. Remove the eggs with a slotted spoon to a baking sheet and let sit until cool. Unwrap the eggs and see the beautiful shapes.